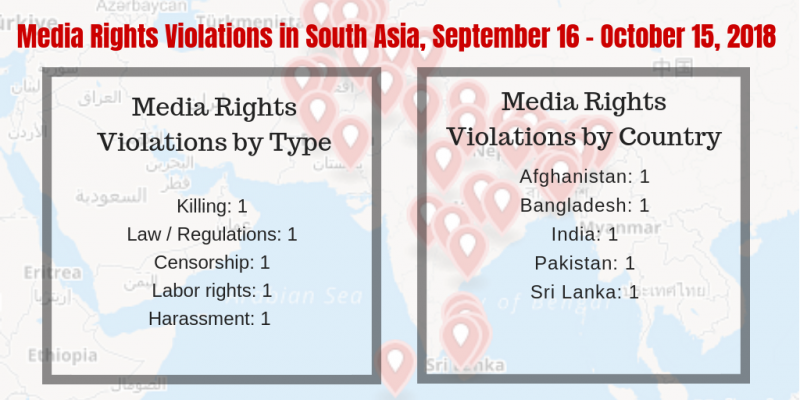 Welcome to the monthly e-bulletin of the South Asia Media Solidarity Network(SAMSN). The next bulletin will be sent on November 15, 2018, and your inputs are most welcome. Indian journalists speaking out against sexual harassment have reignited India’s #MeToo movement. Accusations have been levelled at reporters, senior editors and public officials over sexual misconduct on social media in the past few week. At least two newspapers have launched investigations, while Hindustan Times’ chief of bureau and political editor Prashant Jha stepped down from management roles after screenshots of alleged text messages with a colleague were posted online. Seven women wrote to the Times of India with allegations of sexual misconduct against its Hyderabad resident editor, KR Sreenivas, for unwanted touching, explicit messages and sexual propositions. Sreenivas is on a leave of absence to allow a free and fair inquiry and an independent committee has been set up to look into the matter. Another seven women journalists are on record accusing former journalist and editor and now Minister of State for External Affairs, M J Akbar, of sexual harassment and inappropriate behavior during his time in the media. Many other journalists have followed in the wake of these stories to name other reporters and editors with accusations of sexual misconduct. 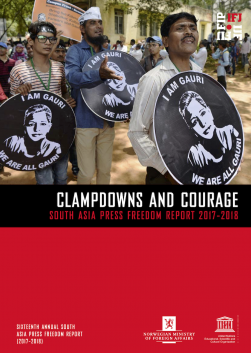 The IFJ, SAMSN, Indian Journalists Union and the National Union of Journalists, India express solidarity with any journalists subjected to harassment in India’s media and calls on media companies to conduct urgent investigations into claims and strengthen sexual harassment policies. Read more. Maldives Democratic Party (MDP) candidate Ibrahim Mohamed Solih has won the 2018 Maldives presidential election beating incumbent president Abdulla Yameen. The IFJ, while congratulating president-elect Solih, urges him to fulfil his election pledges to ensure press freedom and independence of media. During the campaign, Solih pledged to ‘open investigations into journalist Ahmed Rilwan’s disappearance, blogger Yameen Rasheed’s murder, repeal the draconian anti-defamation act and ensure press freedom’. Yameen Rasheed, a 29-old critical blogger and social media activist advocating for rule of law, human rights and social justice, was brutally murdered on April 23, 2017. On August 9, 2016, the Maldivian Parliament passed the Anti-Defamation Act that criminalizes defamatory speech, remarks, writings and actions; and empowers the state authority to shut down media for its ‘defamatory’ contents. Journalist Ahmed Rilwan Abdulla has been missing since August 8, 2014. Read more. Photojournalist M Asif Hakimi was among 22 killed in a bomb blast on an election gathering in northern province of Takhar, Afghanistan on October 13. Hakimi was killed when a motorcycle bomb was detonated around midday targeting the campaign rally of Nazifa Beg, a female candidate from Rustaq district of Takhar. Hakimi was among 22 people killed, and a further 32 were injured. Afghanistan is holding parliamentary and district council elections on October 20. Read more. Bangladesh parliament passed the draconian Digital Security Bill 2018 with provisions curtailing the freedom of expression and independent journalism on September 19. 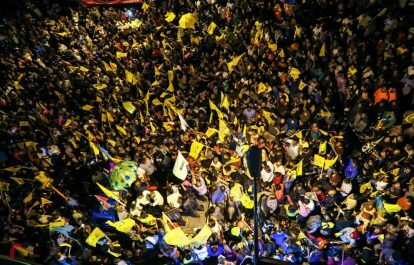 Although the government promised to review the bill after protests from the government, President Abdul Hamid on October 8 signed the bill into law. The formulation of the law was initiated in 2015 with the cabinet approving the draft on January 29, 2018 and placing in the House on April 9, 2018. Sections 8, 21, 25, 28, 29, 31, 32 and 43 of the law posed serious threats to freedom of expression and media. Section 8 includes provisions about blocking or removing any information in the digital media over any content deemed hampering harmony, public order, or creating communal hatred, among other things. According to Section 25, a person may be jailed up to five years for ‘deliberately publishing or broadcast on a website something attacking or intimidating or which can make someone feel disgruntled or knowingly publishing or broadcasting false or distorted information. Section 31states a person may face up to seven years in prison if they are found to have deliberately published or broadcast something on a website which can spread hatred and create enmity. Some of the sections are non-bailable offences. 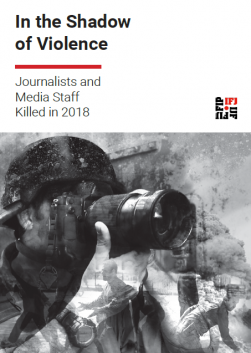 Read the IFJ statement here, news about journalists protests here and here, and views of why the law is dangerous to freedom of expression here, hereand here. Screening of internationally acclaimed film by director Jude Ratnam ‘Demons in Paradise’ was canceled by the organizers of the Jaffna International Film Festival in Sri Lanka citing pressure from local groups. The Tamil-language film, which won the best film award at the Film South Asia 2017 in Kathmandu, explored the civil war in Sri Lanka depicting the life of victims of war, especially in Jaffna. In a statement, director Ratnam claimed the festival organizers decided to remove the film from its scheduled screening on October 5 allegedly over pressure from a group known only as the ‘Community’ in Jaffna. Ratnam said: “I have not yet been given a proper explanation for the removal of my film from the festival schedule. I feel this is a case of censorship and an infringement on the fundamental rights to freedom of expression.” More here. The Press Trust of India (PTI), the largest news agency in India, laid off 297 staff across the country on September 29. A notice by PTI read: “The following employees whose names appear in the list displayed with this notice have been retrenched from the employment of the PTI with immediate effect.” The laid off staff are non-editorial and the management claimed that their posts – transmission supervisors, engineers, assistants and attenders, have become redundant. PTI is regarded as India’s top news agency, run by an elected board of directors consisting of the country’s top media house owners. Letters were sent to the homes of targeted workers. PTI claims that dues have been directly transferred to individual bank accounts. It is also understood copies of the retrenchment letters were placed at the individual employees’ work stations. Read more. The Lahore High Court issued a non-bailable arrest warrant for journalist Cyril Almeida over an interview with former Prime Minister Nawaz Sharif. He is required to appear at the next hearing of a case seeking action against the former PM on charges of treason. On September 24 the Court summoned Almeida, the assistant editor of Dawnnewspaper, to appear for the next hearing on October 8, in a case relating to an interview, published in May, 2018. In the interview, Sharif had said the “attacks in Mumbai (in 2008) were carried out by people from Pakistan,” according to reports. The court also ordered Almeida to be placed on the Exit Control List (ECL), barring him from international travel. Read more. While there are encouraging signs that the media world is taking note of the groundswell of opinion against workplace harassment, there is a greater need to discuss how the complaints will be handled, the transparency with which procedures will be laid down and the secure environment in which the complainants will be given an opportunity to depose. Read more. 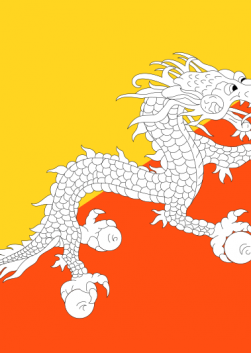 This affects Bhutanese journalists, too. At best, there are one too many nameless officials in the media saying important things, and at worst, no one saying anything. In such a situation, the existence of a Right to Information (RTI) Act would be useful. However, the RTI bill is yet to be enacted despite having been discussed in parliament. More here. Media freedom is essential to a functioning democracy, but reckless use of such freedoms will be the death of it. This was the key takeaway at the 20th anniversary celebration of the Colombo Declaration on Media Freedom and Social Responsibility, where several speakers highlighted the dangers of irresponsible reporting and media coverage. In terms of Sri Lanka, both Mangala Samaraweera and M. A. Sumanthiran – on separate sides of the country’s political divide – were on the same page in calling for stern self-reflection from the media in the country. More here. On June 14, gunfire rang out in Kashmir, drawing startled journalists to their windows. A valley in the foothills of the Himalayas, Kashmir has for decades been the ground of a bloody feud between India and Pakistan; for most of that time, journalists have covered the conflict unfettered by government minders. Recently, however, that has been changing. In May, foreign journalists received an official warning from the administration of Prime Minister Narendra Modi about traveling to “certain areas” without asking for permission; we all knew it was referring to Kashmir. Then a French documentary filmmaker was arrested and interrogated about his time there, as were two Kashmiris—a reporter and a photographer—each accused of having ties to militant groups; one is still in jail. In June, the United Nations released a damning report on human rights abuses in Kashmir. Hours later, gunmen who police claim had ties to the Lashkar-e-Taiba terror group fatally shot Shujaat Bukhari, a well-respected editor at Rising Kashmir newspaper who’d served as mentor to many. The event was tragic. But to many reporters, it was not a total surprise. More here. The government of Nepal has decided to increase the minimum salary of journalists by 25 percent to be effective from October 18. The cabinet decided to hike the minimum monthly salary to Rs 24,300 from existing 19,500. He further informed that the pay hike will be applicable for journalists working in both government-owned and private sector media organizations. Earlier, the Minimum Wages Fixing Committee had recommended Rs 29,700 as minimum salary for journalists proposing 50 percent hike on the existing minimum salary. More here. Things are not normal for independent media in this country [Pakistan]. Journalists in particular are feeling the pressure as their write-ups are either being withheld or edited for reasons other than ‘professional work’. Why are newspapers forced to cut down their pages including their opinion page if things are normal and democracy functional? Why are channels going ‘off air’ without even the knowledge of PEMRA or Information Ministry? What new laws are on the anvil to ‘regulate’ media? What new tactic is being adopted to exert pressure on ‘dissent’? More here. I landed in Dhaka to try and understand the direction of Bangladesh politics as the country gears up for general elections in December, and to see if I could meet the imprisoned 63-year-old photographer and cultural activist Shahidul Alam. Given the continuing vocal belligerence of Prime Minister Sheikh Hasina Wazed and her son and advisor Sajeeb Wazed Joy on the subject of Alam’s imprisonment even two months since his arrest, the top-down political route to get access seemed bleak. So, I sought direct contact with the head jailor of the Dhaka Kendriya Karogar (central jail), Iqbal Kabir. I called him innumerable times on his cellphone and sent him half-a-dozen text messages over two days – to no avail. Understandable, given the level of intolerance the Sheikh Hasina regime has shown towards those who dissent. The judiciary, civil society, parliament and bureaucracy have all been asked to crawl, and it was unlikely that Kabir would be able to stand up. More here. “In the past five years, life has become one of abundant caution for my family and myself. We keep each other informed of our every movement. We call each other regularly despite being in the same city—Chennai. But we are all agreed on one thing: the story of illegal beach sand mining must be told. It must be followed and tracked and the exposés must continue. The background of the vengeance wreaked by the miners of southern Tamil Nadu for my reportage on alleged illegal beach sand mining is known. I had written about it in my four-part series in The Wire. The narrative stopped there in The Wire but the threats, harassment and attempts to intimidate did not.” More here. The ILO is launching the fourth global media competition to recognize exemplary media coverage on labour migration. This year, the competition focuses on labour migration and the fair recruitment of migrant workers. The objective is to encourage quality reporting on labour migration and recruitment-related issues. Such reporting is all the more significant as media often promotes a toxic public narrative based on misperceptions with respect to nationality, national origin, gender and migratory status, reinforcing prejudice, intolerance and stigmatization against migrant workers and their families. Application deadline: October 31. More here.